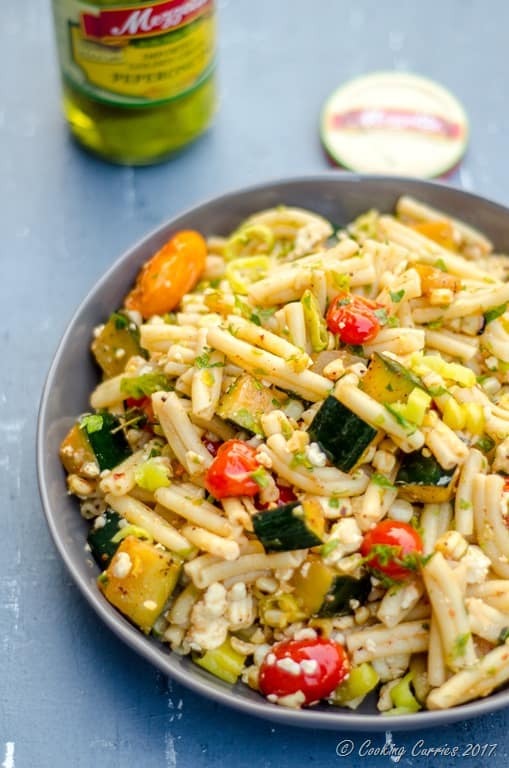 Mediterranean style summer pasta salad with grilled veggies and a special salad dressing that gives a great zing and pop to your salad! 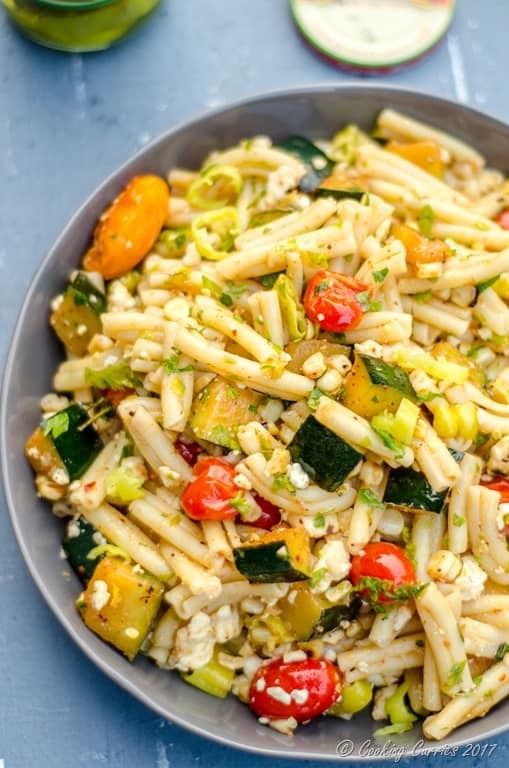 Pasta salads are my go-to meals for summers. Its light yet filling. It does not require a lot of effort yet it can easily be a meal in itself. Now, what more do you need to love pasta salads for summer. 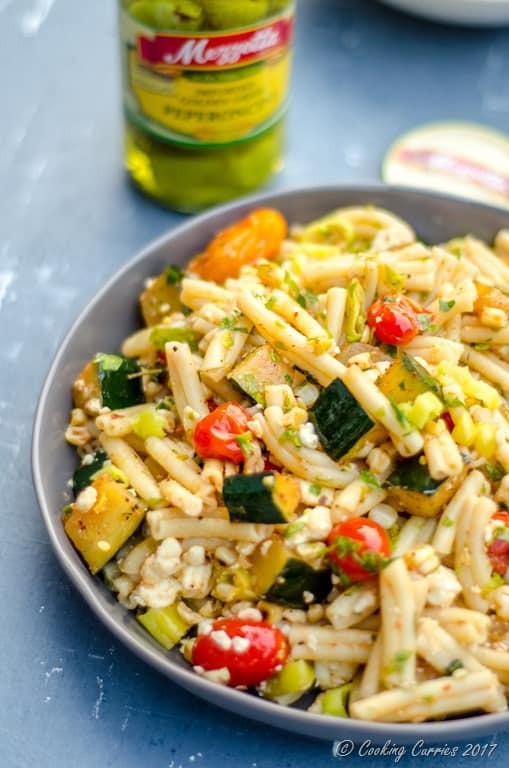 In this Mediterranean Style Pasta Salad, summer vegetables like corn, zucchini and cherry tomatoes are grilled and added along with a special dressing, Mezzetta’s Golden Greek Peperoncini, feta, parsley and mint. The peperoncini gives a refreshing tang to the salad and the crunchy bites in between act as little pockets of juicy surprises. My favorite dressing for summer salads is a mix of olive oil and lemon juice or lemon zest. 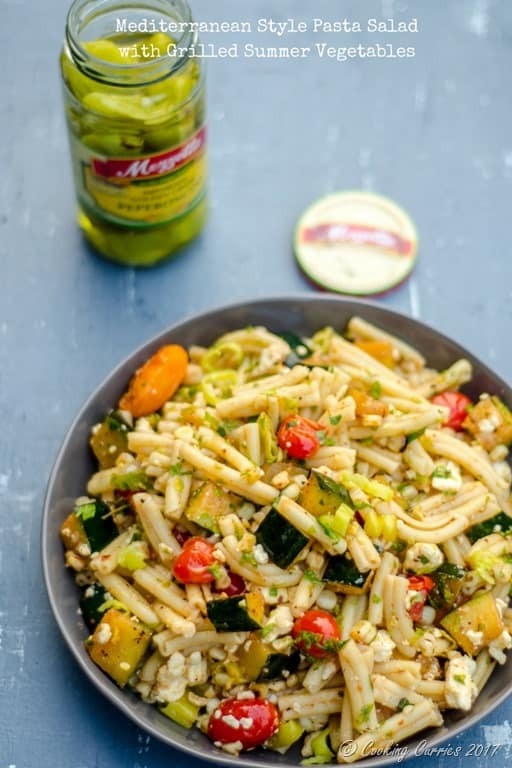 This time around, I wanted to bring the same flavor of the veggies to the rest of the pasta salad as well. So, I added some harissa, that I used to marinate the veggies in, in the dressing, and my secret salad dressing ingredient – some of the juice from the peperoncinis. I think that just carried through the flavor really well and brightened up every bite of the salad. I have always been a fan of Mezzetta’s Roasted Red Peppers and this is my first time trying the peperoncinis. Now, this is definitely going to be a pantry staple and I am definitely going to use the juice of Mezzetta Peperoncini for salad dressings and marinades. It really helps transform your usual, everyday dish to something special and crave-worthy and keeps everyone wondering what that awesome-ness was. I am sure there is gonna be many many more summer salads with Mezzetta Golden Greek Peperoncini featuring in them and I may have to soon run out and get more jars of it. There is definitely not gonna be a forgotten jar of this sitting in my refrigerator, this summer. Before I forget, Mezzetta is hosting a grand giveaway on their website for 50 Meal Kits from Chef’D, that is valued at $1560 and each entry will also receive a 10% coupon, so its a total win-win. DO check it out! Marinate the zuccini and tomatoes with teh olive oil, harissa, salt and pepper for a couple of minutes. Grill them until soft and cooked through. Grill the ear of corn until cooked and charred a little, scrape the corn kernels out and add to the grileld veggies. 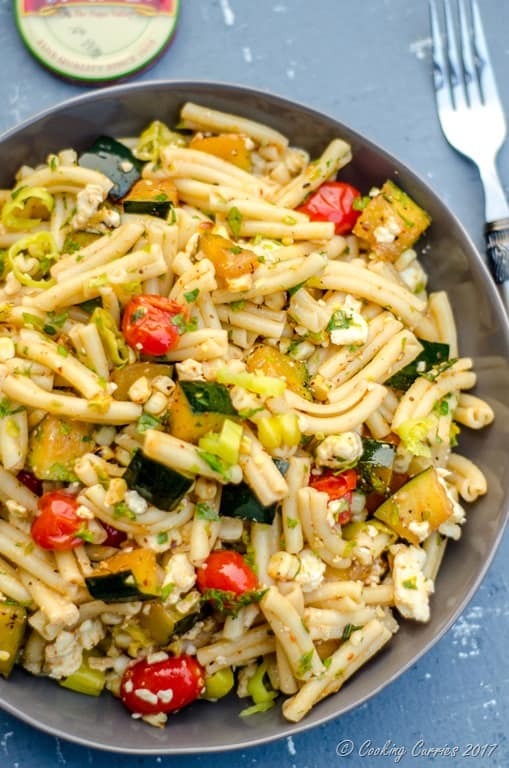 In a large bowl, toss the cooked pasta, the grilled vegetables and corn, chopped Mezzetta Golden Greek Peperoncini, feta, mint and parsley. In a jar, shake well together, the dressing ingredients - lemon juice, olive oil, peperoncini juice, harissa, salt and pepper. Pour the dressing over the pasta salad, toss well and serve immediately.